Here's a story that sounds like it came out of the pages of a sci-fi magazine: It starts with a material called 'quasicrystal' – a strange form of matter that has structure but no repeating crystal patterns. It was so controversial, when it was discovered in 1982, that its discoverer was thrown out of his lab (although he eventually got a nobel prize). Since then quasicrystal has opened up a new world of materials science, but until 2009 the only way to get quasicrystal was to grow it, very carefully, in the lab - it was thought it simply didn’t form in nature, or that it didn't last long if it did. Above: A piece of artificial quasicrystal. Except, of course, it does. Although we have no idea how or why, natural quasicrystal has been found in rocks thought to have come from a meteorite that hit Earth in the Koryack mountains. 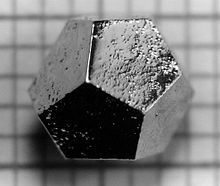 Above: The atomic structure of a quasicrystal roughly 1 micron across. After their acceptance as a real phenomena searches were made in museums and archives for a naturally occurring example of quasicrystal. Eventually minute samples of natural quasicrystal were found by researchers Paul Steinhardt and Luca Bindi - stored in the natural history museum in Florence. Tracking their origin from there proved to be... a bit trickier: The rocks had been smuggled out of Russian by a secret-service agent*. To find it's origin Paul and Luca had tofollow a trail in secret ledgers, and persuade the former secret service agent to help them (the whole story is here). Eventually the trail led to V. V. Kryachko, the man who in 1979 had first dug the rock from sticky clay in the remote Chukotka region of Russia. In 2010 quasicrystals were definitively identified as coming from a rare CV-3 carbanaceous chondrite meteorite, and the green light was given for a return to Chukotka. In the expedition ten scientists, two drivers, and a cook travelled 230 km into the Koryak Mountains of far eastern Siberia to pan one and a half tons of sediment by hand, and survey local streams and mountains. “What does nature know that we don’t? 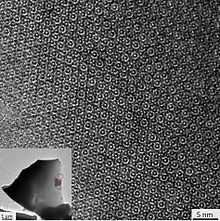 How did the quasicrystal form so perfectly inside a complex meteorite when we normally have to work hard in the laboratory to get anything as perfect? What other new phases can we find in this meteorite and what can they tell us about the early solar system? At the moment, we are at the tip of the iceberg,” said Steinhardt. *Yes, some meteorites are rare enough to be worth smuggling. Especially if they glow green and can kill superman.